Sexta Etas Mudi. - Data est mihi potestas in celo et in terra: Salvator: - SCHEDEL, H.
Title : Sexta Etas Mudi. - Data est mihi potestas in celo et in terra: Salvator:. Size : 14.3 x 8.8 inches. / 36.2 x 22.4 cm. 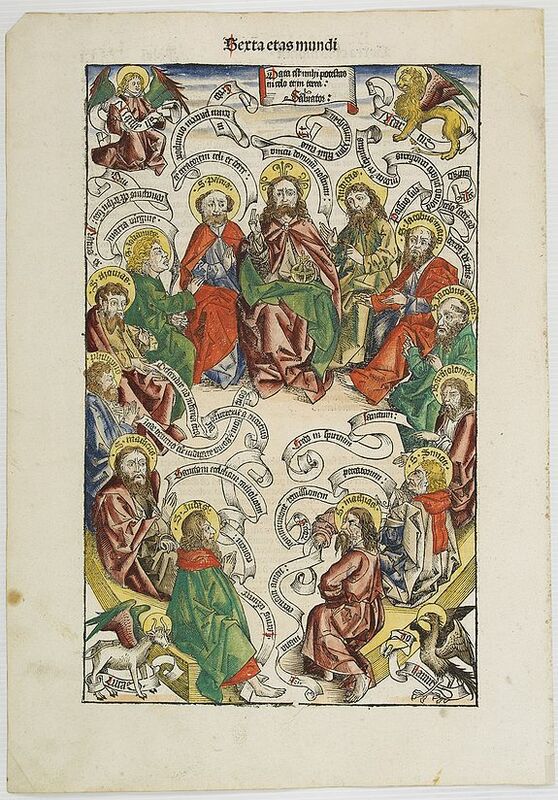 Description :A very fine presentation of Jesus Christ surrounded by the Twelve Apostles. Each of the evangelists being represented by his symbol in the corners. Page from the richest illustrated Incunable, the famous: ,Nuremberg Chronicle,, published the year that Columbus returned to Europe after discovering America. The printing was carried out under the supervision of the great scholar-printer Anton Koberger, whose printing were famous throughout Europe. Condition : Marginal water stain and a few spotting. Good margins and attractive colours. Good condition.